One of the top road trips in the world is what Planet D thought of it. It’s even had the Royal seal of approval by Her Majesty The Queen and His Royal Highness The Duke of Edinburgh on their recent visit. 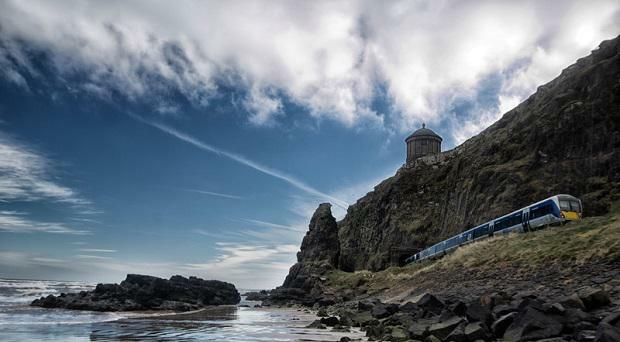 So whether you’re planning to take the Causeway Coastal Route by train, car or on foot, let us inspire you with some of the highlights you’ll experience along the way. With so much to see and do, why not turn your Causeway journey into a coastal getaway? From boutique hotels to gorgeous guest houses, cosy bed and breakfasts to stunning self-catering accommodation, Northern Ireland offers a choice of unique and wonderful places to stay. What’s more, with Tourism NI’s quality assured scheme, you can be sure your short break will be a comfortable one. 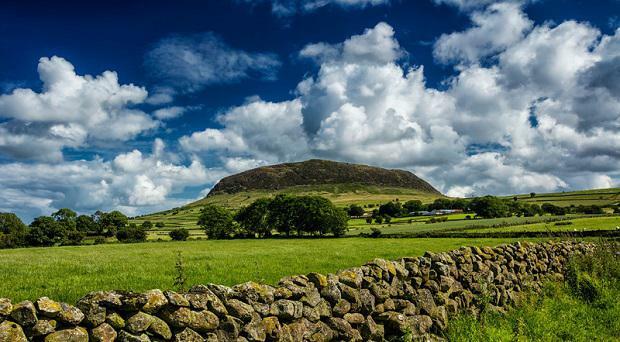 Travel inland and explore the unmistakable profile of Slemish Mountain rising above the surrounding plain. Legend has it this extinct volcano was where Saint Patrick tended sheep for six years after being captured and taken to Ireland. Modern day pilgrims now climb its looped walk to catch the panoramic views from its summit. 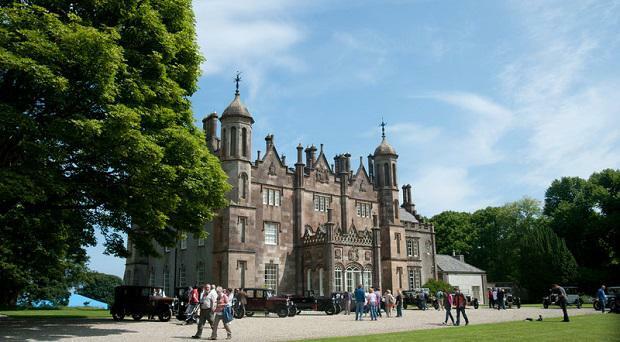 Back on the coastal route, a visit to Glenarm Castle, the ancestral home of the McDonnells, Earls of Antrim, is a must on your causeway short break. With its glorious walled garden and charming tea-room, it’s perfect for stretching the legs and refreshing the senses before you journey on to the Glens of Antrim. Immerse yourself in the breathtaking scenery of the Glens of Antrim all the while uncovering its mythical landscape and lore. 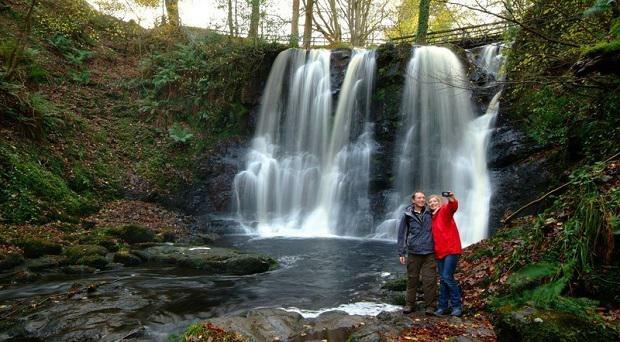 With nine glens to discover, each with its own lyrical name and scenic drive, don’t miss Glenariff Forest Park - set in the ‘Queen of the Glens’ – with its bracing walks and stunningly beautiful waterfalls. Delve deeper into the communities that hold the secrets to this diverse landscape, stopping off in the picturesque towns and villages dotted along the Glen’s path. 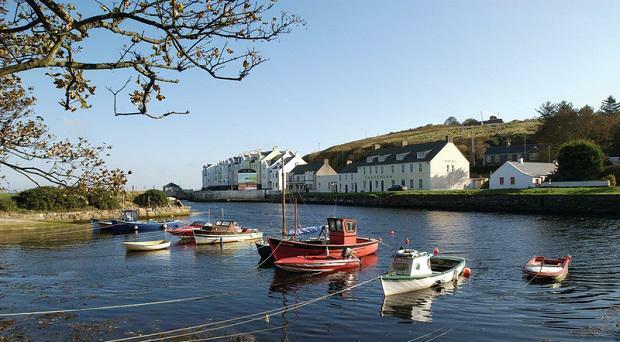 Glenarm, Carnlough, Cushendall and Cushendun have distinct stories to tell. 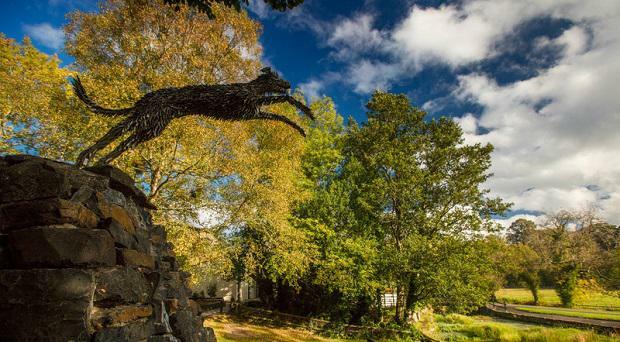 Be sure to catch sight of the beloved sculpture of ‘Johann’ the goat – a famous Cushendun resident! From Cushendun follow the coast road to Ballycastle, where if you have time, hop on the ferry to Rathlin, Northern Ireland’s only inhabited off-shore island. Follow one of the island’s scenic walking trails or learn about island life at the Boathouse Visitor Centre. Home to the largest breeding seabird colonies in Europe, find out more at the popular RSPB Seabird Centre or take in the splendid vista as you climb up Rathlin West Light- affectionately known as the ‘upside down’ lighthouse. For the more leisurely travellers among you, take a detour inland and behold the spectacle that is the Dark Hedges. 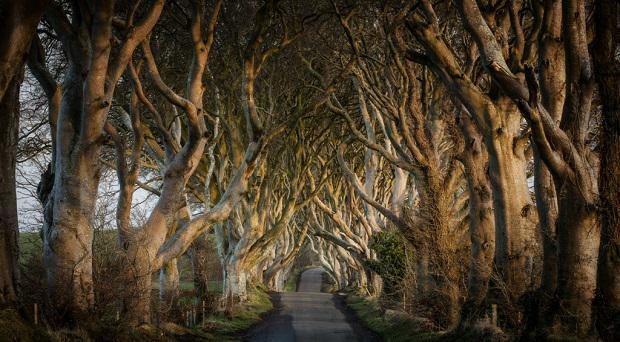 Made famous as a filming location in Games of Thrones, this beech tree-lined avenue has now become one of Northern Ireland’s most iconic landmarks. 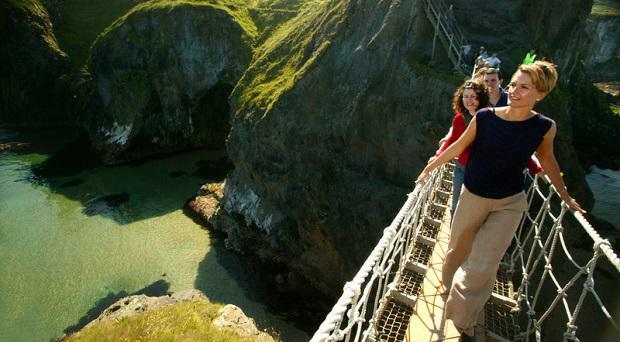 Back along the coast again a cliff-top challenge awaits at the Carrick-A-Rede Rope Bridge. Set amid unrivalled scenery on the coast, the 30-metre deep and 20-metre wide chasm is traversed by a rope bridge that was once a temporary structure built by fishermen to reach the tiny island on the other side. Now much sturdier, the bridge is a popular tourist destination and the perfect vantage point for taking in the surrounding scenery. 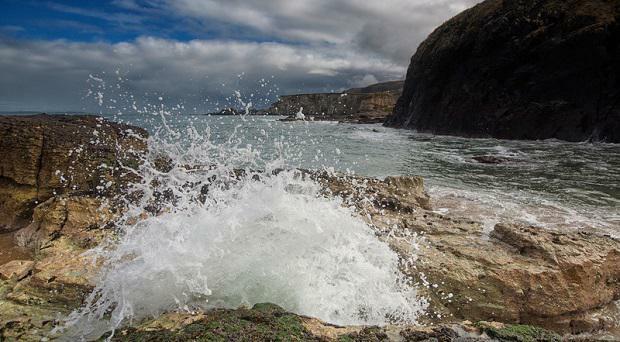 A short distance away your next must-see destination is Ballintoy. Follow the narrow winding road downhill past the white-washed Ballintoy Parish Church – one of Ireland’s most photographed churches – to discover the picture postcard village of Ballintoy and its harbour, another Game of Thrones filming location. Before journeying on to the Giant’s Causeway, take five to stretch the legs with a stroll along Whitepark Bay. 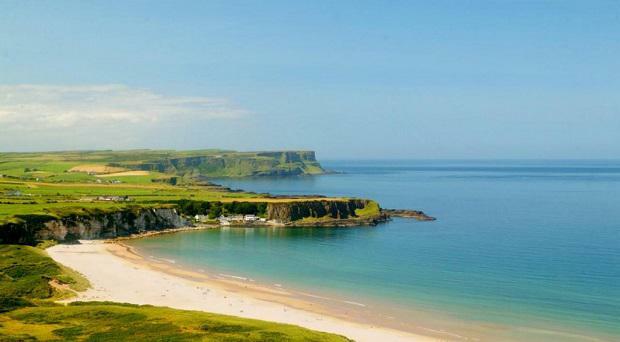 This sunning sandy beach forms a white arc between two headlands on the Causeway Coast. Don’t miss the picturesque little harbour and hamlet of Portbradden at the western end of the bay, home to the beautiful St. Gobban’s Church, one of the smallest in Ireland. 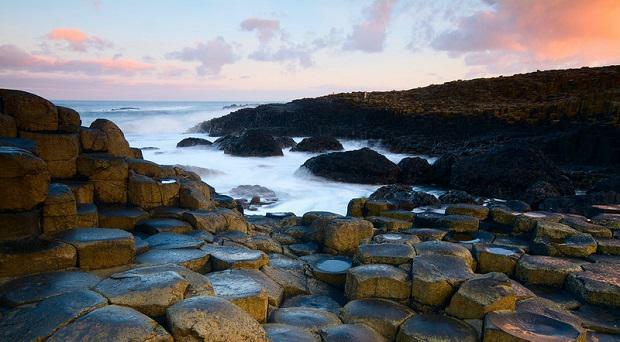 Continuing along the headland is the geological wonder which gives the route its name - The Giant’s Causeway. 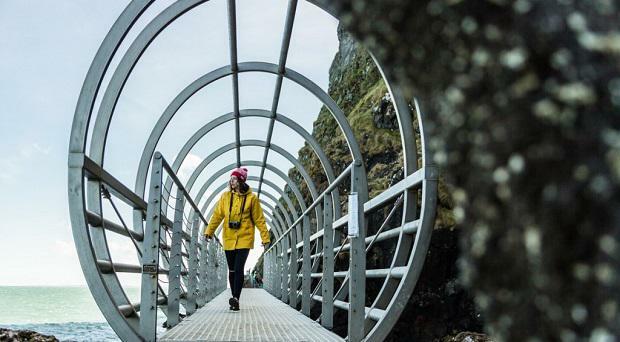 Sitting at the centre of an Area of Outstanding Beauty and Northern Ireland’s only World Heritage Site, start your visit at the state-of-the-art Visitor Centre then stroll down to the intriguing polygonal stones to search out its distinctive formations. 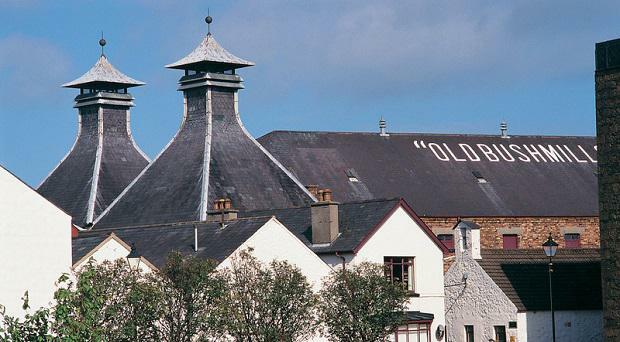 Made famous by its Whiskey namesake, take a tour of Bushmills village and its local distillery. Take in the sights and smells, enjoy tutored tastings before relaxing with a tipple or two in the 1608 bar. Or enjoy a relaxing lunch at the Bushmills Inn, perhaps with a whiskey chaser! 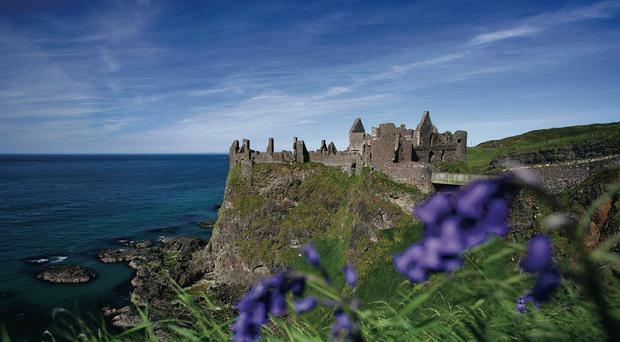 Heading west out of Bushmills the coastal route reveals one of the jewels in Northern Ireland’s crown, Dunluce Castle. Perched dramatically on the cliffs of the coast, this breathtaking castle ruin has inspired artists and writers down through the centuries. Built around 1500 by the local MacQuillan family and later seized by the Scottish MacDonnell clan, discover the castle’s tumultuous history with an audio-visual tour. 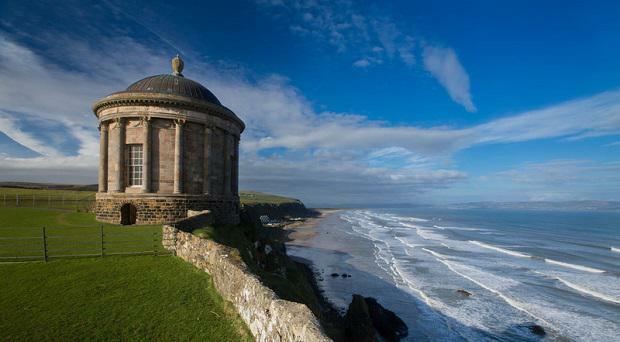 Travelling through the beautiful surroundings of Downhill Demesne, a photographic opportunity not be missed is Mussenden Temple. Perched on a cliff edge high above Downhill Beach this historical building, inspired by the Temple of Vesta near Rome, was built as a summer library by Frederick Augustus Hervey, Bishop of Derry and Earl of Bristol. 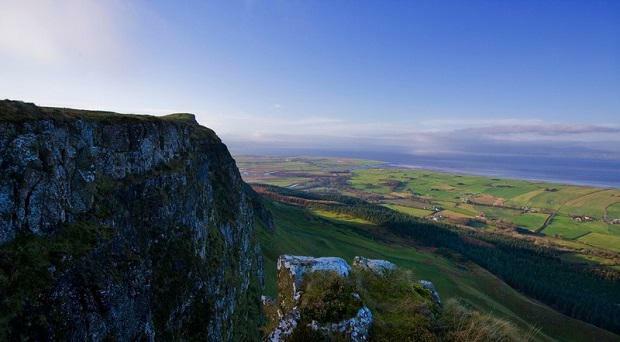 A short distance away, Binevenagh mountain, with its line of dramatic basalt cliffs dominates the surrounding countryside. Take a detour off the main Causeway Coastal Route and ascend a scenic drive to the summit where the panoramic views of Roe Valley, the Sperrin Mountains, North Coast and across Lough Foyle to Donegal, are simply breathtaking. As we continue our journey through County Londonderry, standing guard to the entrance of Lough Foyle is Magilligan Point. 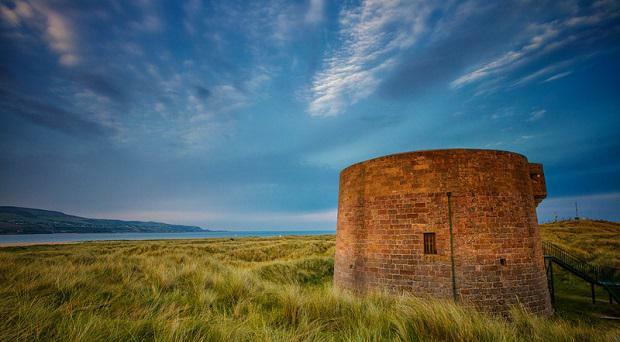 Home to Martello Tower, one of best preserved towers from the Napoleonic Wars, take a stroll along the golden sand dunes of Benone Strand, a multiple recipient of the European Blue Flag and Seaside Award. As your causeway journey nears an end, explore the myths and legends of the scenic Roe Valley area and enjoy the stunning coastal views from the sculpture of Celtic God of the Sea Manannàn Mac Lir or visit the ‘Leap of the Dog’ sculpture inspired by a legend behind the town’s original name, ‘Leim an Mhadaidh’, in nearby Roe Valley Country Park. 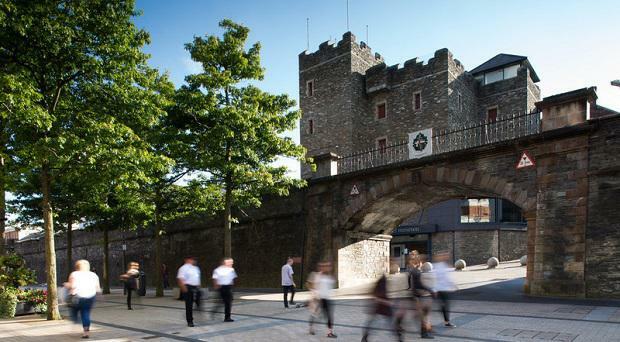 Your Causeway Coastal Route destination is the ancient city of Derry~Londonderry. 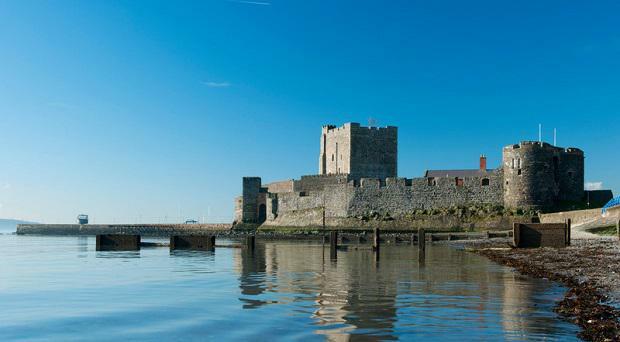 Take a walking tour of Ireland’s only remaining City Walls or visit its many landmark sights, such as St. Columb’s Cathedral, the beautiful neo-gothic style Guildhall and the contemporary Peace Bridge that curves majestically across the River Foyle. Voted 4th in Lonely Planet’s ‘Best in Travel Guide 2013’, and UK City of Culture in 2013, Derry~Londonderry has so much to offer you may find yourself extending your visit for a few more days! 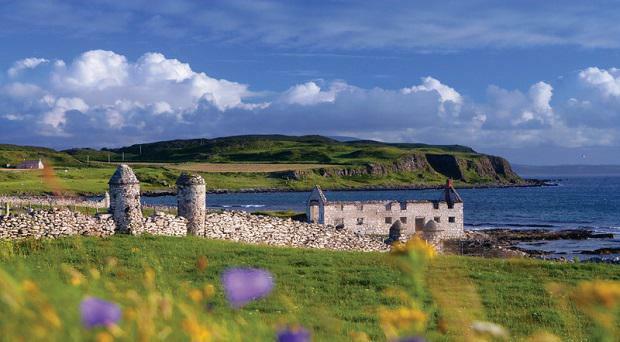 Inspire the senses and start planning your coastal getaway today with discovernorthernireland.com. Tom Sweeney Room with a view? Pól Ó Conghaile Want to step into the Seven Kingdoms? How about a selfie in House Stark, or some up-close views of Kings Landing? Looking for the perfect spring getaway? Then look no further than Belfast.